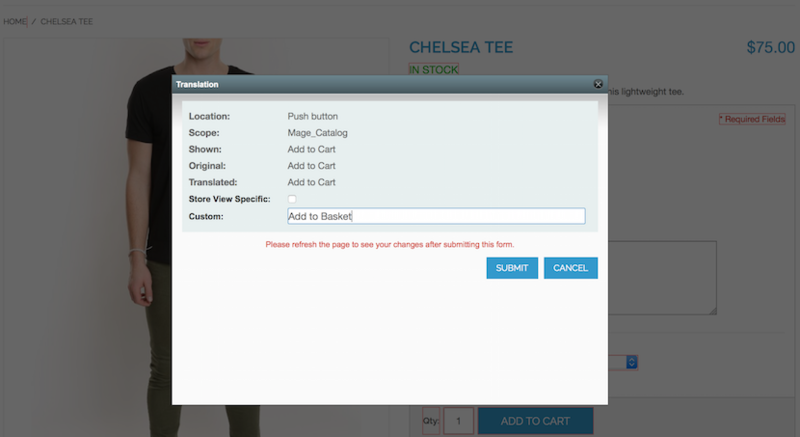 In this post we want to share our expertise on how to manage translations in Magento. We will cover various methods, their priorities and characteristics. We will show you the pros and cons of each solution to match your needs when you change or add a new translation to your online store. All changes (new translations) that are added via this method will be stored in the database (core_translate table). We can enable the Inline Translation for frontend or/and backend from the admin panel by System -> Configuration -> Developer -> Translate Inline. With the Inline Translation method we have the ability to add a new translation to the Default Config (all stores) or to a specific store view. You may notice that the overridden string (original translation) has the following format – Module_Name::Original_Translation. It happens because you add the changes to a specific place (specific module), moreover the same string can appear in a different module. According to these changes you can see the following data in the “core_translate” table. Note that some strings can be translated many times in different modules, so it is better to translate the Add to Cart button using the Module_Name::string (the same syntax as described for the Inline Translation method). to the file with app/design/frontend/rwd/default/locale/en_US/translate.csv path. Once in a while we need to change some translations of the core or a third party module. Editing files in this case is always a bad practice. So, we should add changes in another way. Let’s see which of the methods is more suitable for us. Pros: it’s easy to add a new translation (you don’t have to know a lot about translations in Magento to make these changes, and it is non-technical), it can be applied as a default value (for all stores) or to a specific store view. Cons: when you have a lot of changes it may take much time, and it can be difficult to apply to other Magento stores. Pros or Cons (depends on your needs): it applies only to the theme where you add changes. It’s the best solution for making changes in a current/specific theme only. And it is the worst when you have many themes for your store/websites/devices and you need to make the same changes everywhere. Pros: it’s a good way to add a translation file to your own module, the core, or a third party module. In this way, we added another translation file to the module. The translation files will be merged, so don’t forget to add dependancies to the initialization file for your module when it’s necessary, otherwise your changes may not take effect. "Add to Cart","Add to Basket"
And we will see the results after clearing cache. Hope we have clearly described all translation methods and this information will help you understand the difference and improve your store. Feel free to share your thoughts and questions in comments below.